Since 1979, Marquis has been designing and manufacturing quality bathroom furniture in the New South Wales Hunter Valley. 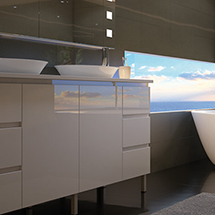 Proudly Australian owned, Marquis offers one of the most diverse selections of bathroom cabinet styles and finishes available on Australia's East Coast – and provides custom solutions. Marquis aims to ensure Australian bathrooms are comparative with European innovation and design while remaining sympathetic to current Australian styles. From the brilliant lustre of high-gloss two-pack polyurethane to the contemporary textures of high-grade laminates, you can be sure there is a Marquis cabinet to suit your bathroom. Marquis' range of vanity tops include original Caesarstone, Silestone, Marble, Symphony Solid Surface, Vitreous China, Polymarble and Acrylic.